Who ordered a super tasty grain-free and yeast-free pizza? Hold your tablecloths! Here comes your waitress with so jaunty dance moves that even the pale white pizza on my tray almost blushes. 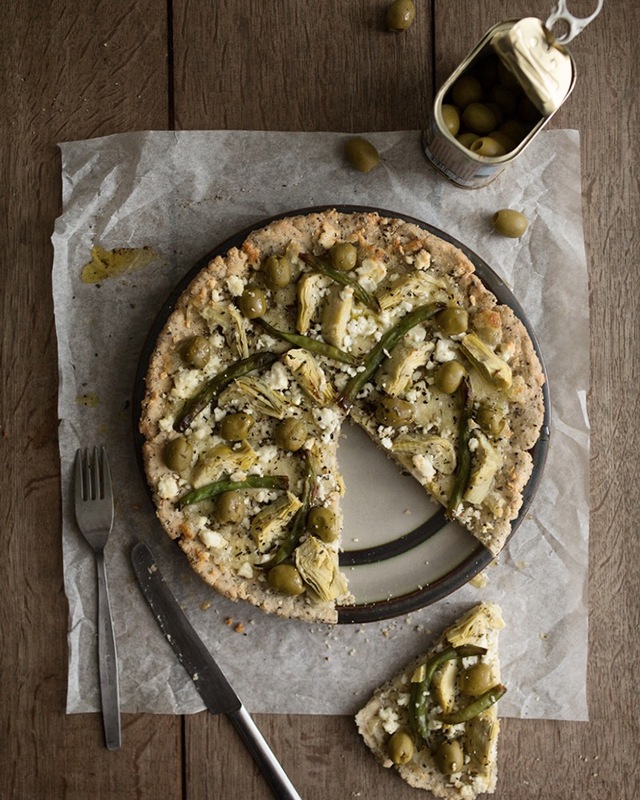 But what can you do when you have created something so tasty and phenomenal – A delicious white pizza that is build on a gluten-free, yeast-free and vegan pizza crust and which is one amazing combination of a crispy pizza and and a rich savory pie – with a hint of flaky mouthfeel to it. It is simply a hit! I first planned to post it on friday, which is a classcial pizza day, but then thought, screw that, I´m probably going to make it on every evening this week so I must give others the opportunity to do that also. And preparing this “pizza pie” takes less than 20 minutes so you could actually make it even on your lunch break. Try these out and find your favorite! Preheat the oven to 400 Fahrenheit/200 Celsius degrees. Mix water and chia seeds in in a small bowl and set aside for about 5 minutes. In the meantime put all the other ingredients into a bowl and mix. Add the chia seed mixture (or 2 eggs) and stir. Place the dough on a parchment lined baking paper and press or roll the crust to be about half an inch in width. Bake for about 12 minutes or just until the crust starts to become a very light golden brown. Take out from the oven, add the toppings and put back for about 5 more minutes, or until the cheese is well melted. 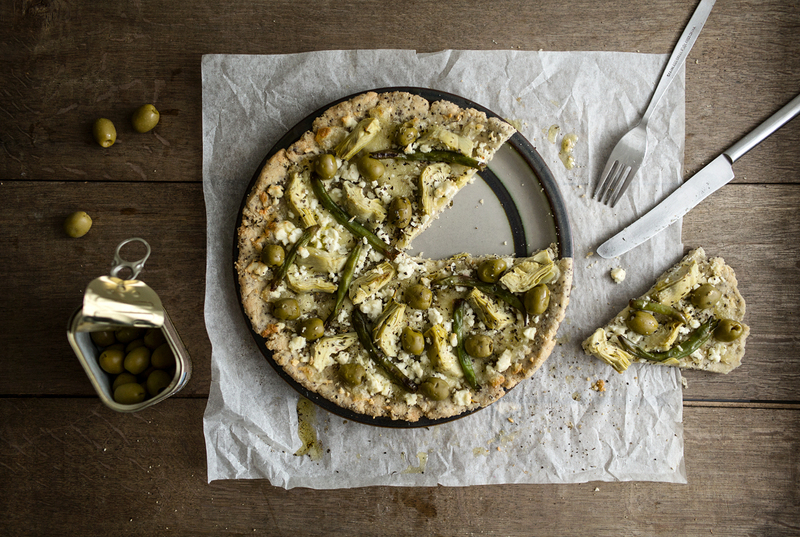 Take out from the oven, sprinkle some olive oil on top, serve and enjoy! Yay, what a lovely grain and egg free pizza! I tried this and very yummy it was, indeed. I tweaked the recipe just a little and thought that maybe some of you'd like to try it. I spread some pesto sauce (mixed fresh basil, spinach, olive oil, salt, pepper and garlic) on top of the crust before adding the fillings. The pizza turned out to be pretty white and green - and it could have been performing in a spring time fashion show! Looks awesome! Will have to give it a try! What do you think could I use coconut flour instead of almond meal?